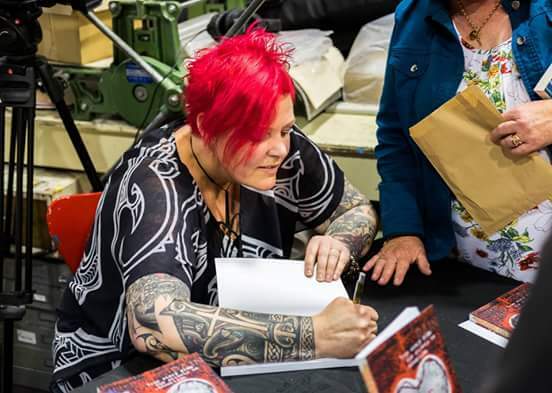 Auckland artist and writer Anita Mary loves punk music and her life could be a lyric from a song by one of her favourite bands. 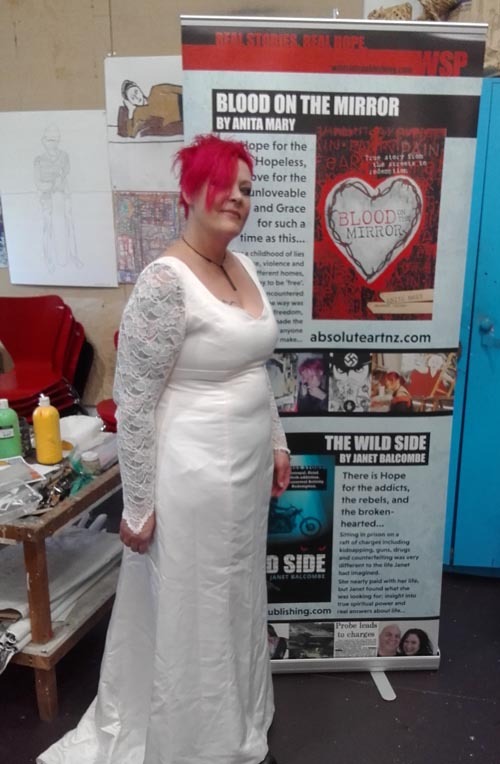 Eighteen schools, violence, abuse, homelessness, confusion, depression, drugs and prostitution marked Anita Mary’s days for many years until she found God, the arts and a pathway to redemption. 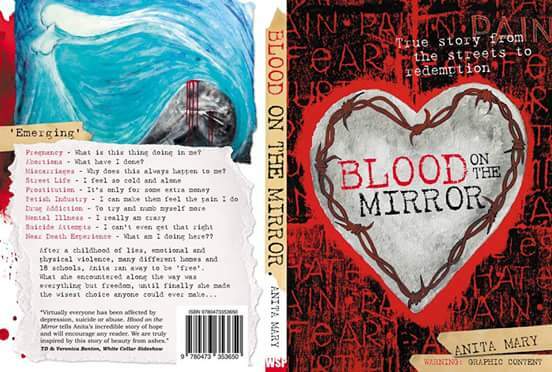 These are the subjects of Anita Mary’s first book Blood On The Mirror, a personal account of a troubled life but also of creative expression and strength. As an artist and board member at Toi Ora Live Art Trust in Auckland, Anita Mary says that arts and creativity have been crucial in her journey to self-discovery and healing. “It’s a way to release my heart and make sense of the world around me,” she says. Anita Mary’s first encounter with art was with her grandmother when she was nine-years old. “We used to go to visit her every other weekend and one day she offered to teach me how to draw. I never drew anywhere else. Not even at school,” she explains. Drawing became a part of the journal - then she started writing. “Writing was like having someone to talk to,” she says. “It helped when I felt I didn’t have a responsible adult around me. After she ran away from home at the age of 15, Anita Mary started a nomadic life. Many things happened during these years, including a car accident that almost killed her. Doctors said she could never talk, walk or do anything by herself again. But against all the odds, she has done all of those things – and more. Commenting on her artwork, Anita Mary says she has an eye for detail, colour, textures and movement. “Also, I’ve always been able to find what’s not said in conversations or situations and so my drawings and paintings reflects this,” she explains. They also reflect the “before and after” of her life. The arts, creativity and her church are crucial in helping her manage the chronic pain she suffers as a result of the car accident. Although she tried all the resources from the Chronic Pain Management System, nothing worked. “Janet McLeod from the Auckland Regional Pain Service encouraged me to draw consistently because I found some relief from it. She also took me to Toi Ora Live Art Trust in 2011,” she explains. For Anita Mary, Toi Ora feels like home. In her time there, she has learned how to let go of her inhibitions and self-criticism as an artist. She says she found a supportive community of creative people who she trusts and feels comfortable around. Anita Mary’s book was launched on Friday 14 October on the twenty-sixth anniversary of her car accident. “It’s a very special date for me because it marks the beginning of my journey. I shouldn’t be here, talking, painting or doing anything. But I am because there was a big purpose waiting for me,” she says. She hopes she can help others with her story. “There are other people out there who, like me, can’t see how valuable they are so I hope my book can help others to find a pathway to heal. Looking ahead, Anita Mary is planning to write a second book about her journey as a person of faith. In the meantime, she’s speaking around the country on topics such as suicide, depression and mental health, and how art and her faith together brought release. Original generation time 1.3131 seconds. Cache Loaded in: 0.0470 seconds.